Back in the 1940s when my father and his folks lived on Garcia Avenue in San Francisco, in a part of town the upwardly mobile might refer to as Forest Hill and everyone else called West Portal, around the corner lived the San Francisco County district attorney, Edmund G. “Pat” Brown, and his young family. The middle sister was my father’s age, and they spent enough time together that, in later life, he would mention her with a smile, even though Democrats and their kin were about as plentiful as Martians around our home and in his universe. 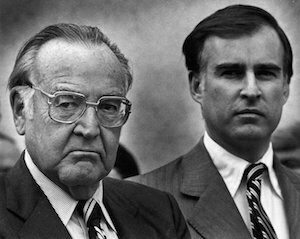 But he always had a regard for Pat Brown, and when Father was grown and I was young, he gave his highest political praise in describing Brown as “tough as nails”. (Left) former California Governor Pat Brown and (right) current California governor Jerry Brown. Brown was progressive and inclusive and his stand against WWII-era Japanese-American internment was something that, very slowly, Father came to see as right and fair and in the American grain. But I am getting ahead of myself. In the late 1940s, San Francisco was beset with transport policy problems, and Mayor Roger D. Lapham was in a world of hurt over it. There were battles over the preservation of cable cars, public ownership of transport, infrastructure spending, and ultimately an unsuccessful recall election over a hike in the streetcar fares. His grandson, Lewis H. Lapham, was editor of Harper’s when I was just starting out in my career, and he usually stopped by my weekly staff cocktail party. There was nothing that an editor of Harper’s could have to say to a young media cub about literary or world affairs, but I had the most affordable Stolicihnaya anywhere near New York’s Bleecker Street and Broadway at 5 o’clock on a Friday afternoon. Sometimes, he would reminisce about his San Francisco childhood and his grandfather’s imbroglios. It’s always fairness, in the end, isn’t it? The world would be a lot farther along on a raft-full of issues if we could agree — in the sphere of transportation or anything else — who should bear the cost, and how benefits are allocated. In the advanced bioeconomy, we see the problem of fairness in carbon policy, in the debate over public spending, mandates, incentives, rebates and so forth. But it’s everywhere — from allies brawling over military allocations, to the debate over health care, safe bridges, taxes for corporations, or pensions for the aged. What do we want and who’s going to pay for it? What’s fair? Here in the late 2010s. California is beset with transport policy problems, and Governor Jerry Brown is about to be in a world of, if not hurt, some discomfort over it. Sigh. Not much changes. 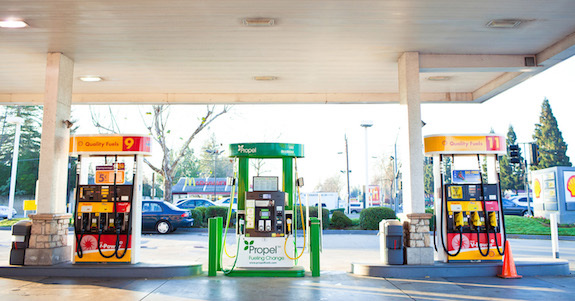 The particulars are the subject of a white paper from a team at Propel Fuels — Rob Elam, Will Faulkner, Chris LaPlante, Parker Chase — and available here. The topics include regressive taxes that penalize the poor, non-inclusion of the disadvantaged, and hand-outs aimed at wealthy elites. My, oh my. Something you’d expect to hear support for in the Bohemian Grove of an older time or at the “right tables” at the Pacific-Union Club — rather than a charge leveled at Governor Brown and a left-leaning California legislature. But that’s the case that Propel is making, and it’s well worth a read. Progression, inclusion, relief. Terms that we might consider to be bundled up in the general subject of fairness, and the allocation of burden. Who will (really) Bear Any Burden? Whether we will find such clarity in carbon policy, as in the defense of liberty, remains to be seen, but this Propel white paper ties he success of political support for change to ideas of fairness. A fair deal is something everyone can get behind, and stay behind. In 1775, Patrick Henry gave his famous “Liberty or Death” speech in support of a resolution to raise a Virginia militia, and the merits of the measure, seen against the backdrop of the opening maneuvers of the Revolutionary War, seem obvious now, but it passed by the barest of margins. The opposition was led by Robert Carter Nicholas, the colonial treasurer, and among the primary issues was the levy for money that was expected. Who pays, who benefits? It was then, as now. Pay any price? Bear any burden? It was stirring but empty Kennedy rhetoric. Because no one will pay any price for anything, or bear any burden for it, either. Otherwise, Ronald Reagan wouldn’t have been at the Berlin Wall in the 1980s asking Gorbachev to tear it down — the Army Corps of Engineers could have done the job in two shakes, if there was no burden that could not have been borne. And, today, there is an obvious path to solving the geopolitical problems posed by North Korea if anyone were really interested to “pay any price” whatsoever in assuring the success of liberty. The debate over energy, or security in the Far East, will come down to the “how much” and “who” of the burden and the price — and, in the case of energy, the Propel team is focusing more attention on that “who”. From fairness flows policy endurance, from endurance flows stability, and from stability flows the technologies that feed transformation. So let us talk about the “who” as well as the “how much”. That’s right and fair, and in the American grain. You can read the Propel white paper here.